It is no great surprise that Germany, a country that is leading the world in renewable energy generation, would have a strong community of biochar researchers and practitioners. Not wanting to miss out on an opportunity to see some cutting-edge biochar work, I made sure to arrive a day early for the IBI Biochar Characterization Standards meeting in Frankfurt, Germany. 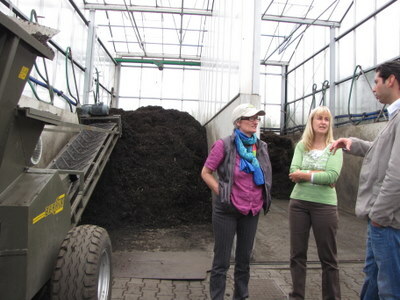 Development specialist and Frankfurt area resident Christa Roth (author of the GIZ Micro-Gasification Manual) kindly agreed to help me set up visits and drive me to see ongoing biochar research at the University of Giessen and the Palaterra biochar compost facility at Hengstbacherhof. We met researcher Claudia Kammann at her lab at the Department of Plant Ecology, University of Giessen, 60 km north of Frankfurt. Dr. Kammann has worked on characterizing a variety of biochars and hydrochars (hydrochars are produced by hydrothermal carbonization). Some of her recent publications have looked at biochar’s role in drought tolerance and metal uptake by plants in sandy soils, and she is now developing a set of simple, cheap and easy biotoxicity tests (variations of worm avoidance tests and plant germination tests) that will accurately identify toxic substances in a charred material. After a peek into Claudia’s well-stocked closet of biochar samples, and a look at some student biochar projects in the greenhouses, we drove out to the University’s Free Air Carbon Dioxide Enrichment (FACE) experiment site. The longest running experiment of its type in Europe, the FACE project consists of rings of piping that blow CO2 onto patches of native grassland in order to study how ecosystems respond to elevated atmospheric CO2 levels. Claudia showed us a grid of biochar test plots nearby where she and PhD Student Sonja Schimmelpfennig are looking at the long-term C stability of a biochar, made from Miscanthus (a C4 plant with a distinct isotopic 13C signature different to that of the soil), as compared to the initial Miscanthus feedstock, or Miscanthus hydrochar. The group also monitors greenhouse gas fluxes (CO2, N2O, CH4) from the biochar-amended plots, one of the key research areas of the group, and determines the yield and plant community responses to the different biochars. Location of the test plots at the FACE site means that a large amount of baseline data on plant growth and environmental conditions is available to be included in the analysis of results. After grabbing a quick bite to eat (Pflaumenkuchen from a Konditorei – delicious! ), we headed back south and west to the tiny village of Hengstbacherhof, in the German state of Rhineland-Palatinate, to visit the Palaterra biochar compost pilot project. Palaterra is a joint venture between wastewater treatment consultants Areal GmbH and project developer Juvi. We arrived on site and immediately went to look at the carbonizer, a continuous rotary pyrolyzer (biochar output is 11kg/hr) manufactured by Pyreg GmbH. Although it was not operating that day, we could see several large containers of biochar material. A childrens’ summer camp with tipi tents and a ball field is located next door to the small pyrolysis unit, and engineer Wilfried Fischer told us that the plant operates with nearly zero emissions. The feedstock used is woodchips from forestry waste, and the pyrolysis temperature can range from 400 to 600 degrees C, depending on the location inside the reactor. Future plans include testing other feedstocks like switchgrass and sewage sludge in the unit, and also using the waste heat in the adjacent compost facility. Andre Daum of Areal gave us a tour of the compost operation. Consisting of a number of bins housed in a greenhouse, this is the heart of the process designed to make 1500 cubic meters of “New Terra Preta” a year. The three main ingredients are wood waste, slurry from a biodigester at a nearby swine farm, and the biochar produced onsite. It is a four stage process that takes only four weeks to complete: first the wood waste and biochar are soaked in the liquid digestate and mixed. Stage two is a period of hot aerobic decomposition. The third stage is anaerobic lactic acid fermentation. Finally, it is dried and bagged as a finished product. The Palaterra facility is located on an old farmstead that doubles as a recreation site hosting a “Tipi Dorf” or tipi village, and the former farmhouse and other buildings on the property have been beautifully restored to provide additional housing and facilities for guests. Joachim Böttcher, who is CEO of Areal GmbH and co-founder of Palaterra, lives on the property, and the income from visitors helps to support his work. Not only that, the graywater and blackwater waste (sewage) from the visitors and staff contributes to an experimental wetland treatment site located on the property. Böttcher believes that, like the ancient Amazonians and other traditional societies, we must make use of every waste product and “close the loop” for long term sustainability. His ultimate goal is large scale conversion of human waste into Terra Preta, replacing today’s wastewater treatment plants and saving water. The incentives to develop wastewater treatment alternatives are considerable; Böttcher told us that in Germany, one pays more for water that goes into the wastewater system than for the supply of clean water. Not only does existing sewage treatment fail to recover nutrients, it is aerobic and emits greenhouse gases. The Palaterra project and a larger project breaking ground at the nearby Morbach Energy Village have received considerable public funding and investment from the EU and other entities. Joachim Böttcher’s vision extends even farther afield. He calls Terra Preta sanitation a “key innovation for the rest of the world” and wants to see it implemented in the regions of North Africa that grow vegetables for the EU market. To spread the idea, Palaterra is beginning to offer franchise licenses and is holding monthly workshops to teach the patented process to license holders. As Joachim showed us around his lushly productive biochar garden, he pointed to a line of plastic bins and told us how he first began combining biochar and waste several years ago. He claims that he has “cracked the code” and recreated the Terra Preta process of the ancients. Perhaps he has, but science cannot yet tell us with any certainty how the ancient Amazonians made the Terra Preta soils, so who can say? Still, it is very easy to see that Joachim is on the right path and that perhaps the more important code is not a specific recipe for Terra Preta, but a social code for sustainable living on a small planet. Before heading back to Frankfurt, Claudia Kammann loaded up the car with bags of Palaterra soil for her biochar sample collection. Check the Palaterra site for retail hours and information about bulk orders. 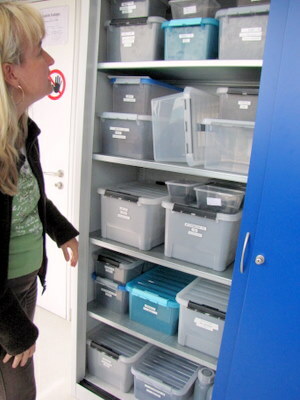 Dr. Claudia Kammann shows a part of her collection of biochar samples; all photos courtesy of Kelpie Wilson. 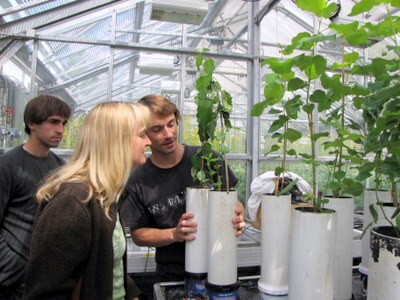 Dr. Kammann examines a student biochar experiment. Andre Daum explains the Palaterra production process. 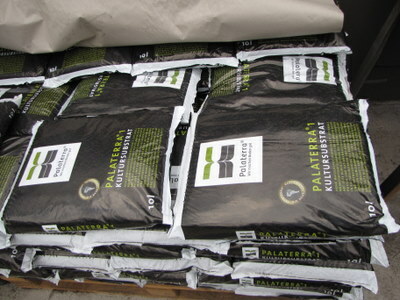 Bags of Palaterra soil ready for purchase. 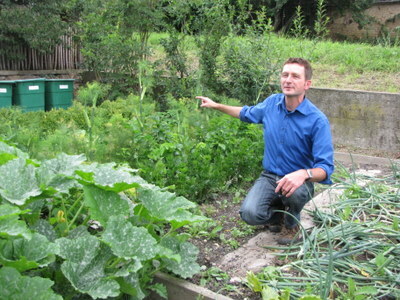 Joachim Böttcher in his biochar garden, pointing to the buckets where he first combined biochar and human waste to make his “Neue Terra Preta”.